Kyrie Coleman is a player who has continuously taken advantage of opportunities in his basketball career. The 6’7 forward has had a long journey before arriving at Wilfrid Laurier Univerity this season. Coleman grew up in Washington, D.C., where his family currently resides and knows that his parents are an important reason why he loves the game. However, after a childhood where nothing came easy, basketball was more than just a game to him. “Because I grew up in poverty,I just felt like I did it to stay out of trouble”, he said. Following high school, he took two years off to figure out what he wanted to do with his life. During that time, he decided he wanted to play the game he loved. Over the two years he was at Brandon University, Coleman put up strong numbers posting 9.8 points per game to go along with 6.8 rebounds per game in 24 games played with the Bobcats. After his time in Manitoba, Coleman decided to go in a new direction and go to Edmonton for a year. However he explained being so far away from home wasn’t the right fit for him. “After a year in Edmonton I missed home. I had the opportunity to go to [the University of Waterloo], which allowed me to be closer to home,” he said. Despite being closer to home, he still felt he was missing something and took a year off after his year at UW. This eventually led him to Laurier. “I just decided to dedicate my last year to a smaller school but I didn’t want to move out the area. So I decided on Laurier,” he said. According to Coleman, he had a lot of respect for Will Coulthard, a fourth-year guard, who opened the doors and helped him become a vital part of the Hawks core group. “He’s accepted me. Because it’s hard coming from a different team and you want to get respect from the best player, and from day one, he gave me respect and came and talked to me … and I respect that,” he said. Coleman is the oldest player on the Golden Hawks current active roster. When asked what he brings to the team, he said he believes his experience and maturity are key virtues in his ability to provide strong leadership to the club as well as be a dynamic player. When asked about how he feels Laurier compares to the other schools he has been a part of, he was profoundly satisfied with his choice for his final year. “This school is a smaller school compared to the other ones I’ve been to. The athletics around here is supported by everyone. Everybody is full of school spirit and enthusiasm and that is the reason why I like this school,” he said. In four games this year he is averaging 11 points, 7.5 rebounds to go along with 48.6% shooting from the field. He has averaged 30 minutes of play per game. 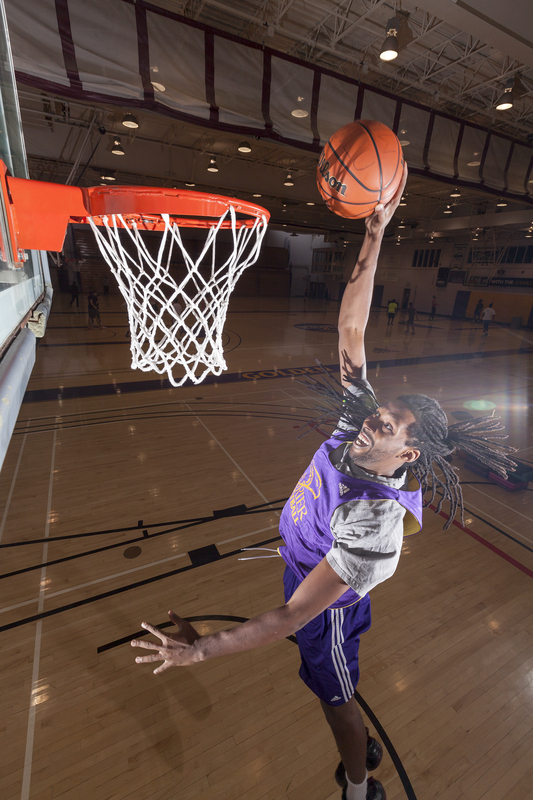 Coleman ended up at Wilfrid Laurier through the ability to take advantage of opportunities and his love of the game of basketball. As for his goals for the team and the upcoming season, Coleman’s message is simple. “As long as we compete and give it our best every time we step out on the court, anything can happen,” he said.